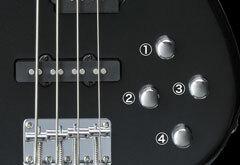 Shop Yamaha TRBX204 Electric Bass Guitar from AMS with 0% Interest Payment Plans and Free Shipping. The versatile TRBX204 bass has active electronics for a variety of tones to match your playing style. The gorgeous finish on the basswood body matches the headstock for a powerful look on stage. The maple neck with rosewood fretboard has great access and is very smooth to play. Additional features are a 4-control circuit that includes controls for Master Volume, Balance, and a 2-band equalizer for creating a more aggressive tone.